Xana Bard comes home one muggy afternoon to find a murdered man in her back yard. Knowing that even with an airtight alibi she and anyone living with her will be a suspect, she warns her off-the-grid lover Thorne Ardall to stay away until the murderer is caught. How will Xana unravel the mystery of the body in the back yard? How will World War II, gold fever, and a road trip with DeLeon Davies at the wheel factor into solving the murder? And when will the insufferably hot weather ever cool down? 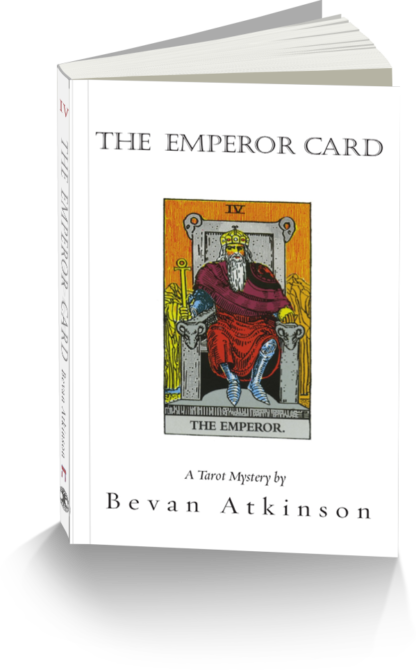 "The Emperor Card is the best installment so far in Bevan’s clever and engaging series." -- Laurie Sain, co-author of best-selling The Hidden Leader: Discover and Develop Greatness Within Your Company. "Mystery readers are always asking for a new series to read, especially ones with a woman sleuth. The Tarot Mysteries—well-written, fast and fun, set in San Francisco and laced with a soupcon of the occult—are easy to recommend." "Xana Bard is cooling off at home with a glass of iced tea when she steps out onto her deck to find the dead body of a man. Right away she knows that she’ll be a suspect, especially when the man turns out to be her father who she hasn’t seen in several years. When her siblings arrive, she has to find a way to break the news to them while asking for their help. A road trip with her friends, DeLeon Davies and Thorne Ardall, gets her closer to solving the case, but can she find answers before the killer strikes again? Every character is seen from Xana’s perspective and the descriptions are vivid and delightful, with each containing distinct voices and charisma. The humor is quirky, light, and well-fitted to the cozy mystery genre. The bad guys are a bit stereotypical, but the reasoning is valid, and the twists along the way keep the mystery interesting. With charm and emotion, The Emperor Card is a character-driven mystery that’s perfect for any fan of cozy mysteries."